Late-season nitrogen, genetics and quality stands motivate this grower to continued excellence. What cropping changes do you make after your best corn crop ever? If you're JC Henrekin, you continue looking for ways to unlock more yields from your soils. To get perspective on his 2018 plans, we'll first look at how his 2017 crops are setting him up for 2018. Henrekin credits his top 2017 corn yields to a combination of excellent stands, today's genetics and applying late-season nitrogen on marginal soils. "I credit a lot of last year's corn yield success to excellent ear count–which was the result of phenomenal stands," says Henrekin, who farms near Deer Grove, Illinois. "We planted into some pretty wet, cool conditions last spring, and yet the corn seedlings came up much more even than we'd experienced in the past under these types of conditions. Why great stands? "Getting the seed planted at the precise depth from one kernel to the next was a big part of why we got great stands," says Henrekin. "And those stands were a result of significant investments we've made to our planter the past several years," he adds. Henrekin uses a 24-row Case International 1250 planter, but notes there's not a lot left on it that's original. Planter changes include adding clean sweeps, row cleaners, precision meters and DeltaForce to control downforce. "Those changes have really been paying for themselves," says Henrekin. Any new changes for 2018? "We always keep an eye out for new planter technologies," says Henrekin. "But for 2018, we're set." Focusing on the special needs of marginal soils has been another big contributor to improved yields. "We have a fair amount of variability in our soils," explains Henrekin. "In some cases we have sand on one acre next to heavy Drummer soil types the next acre over. We even have a bit of gumbo and some peat soils." Over the past three years Henrekin has been focusing on improving yields on marginal soils, such as sandy spots and waterholes–with good results. "We've easily added 50 bushels per acre yield over the last three years on our marginal soils by adding an extra shot of nitrogen during the final late June/early July nitrogen application." Henrekin makes that last nitrogen application around the V10 stage using his 360 Yield Center Y-Drop System. That third nitrogen application is made variable rate with rates ranging from 40 to 100 units based on such factors as spring rainfall, soil type and previous crop history. Henrekin periodically tests his variable-rate nitrogen assumptions with side-by-side field tests. "We'll test a field or area by setting up three strips–applying the standard rate on one strip and comparing that against strips on both sides where we will apply slightly higher and slightly lower rates. Last year there was only one field where we saw an economic benefit to applying a slightly lower rate. In all others the tests validated our rate assumptions," says Henrekin. 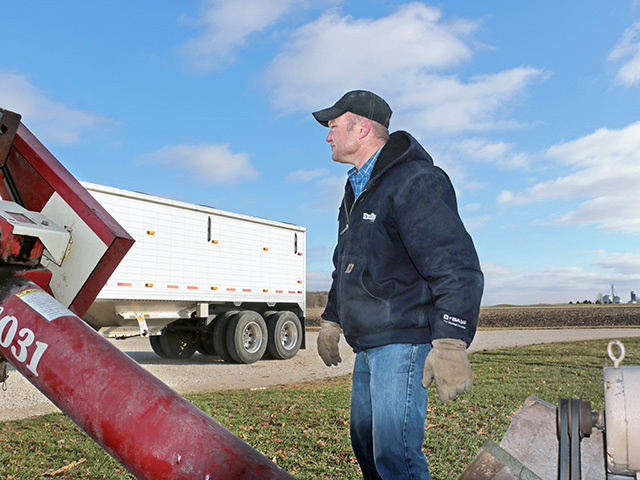 Henrekin's first nitrogen application is a late fall or early spring application of anhydrous. He usually applies 15% to 20% in late fall, preferring spring application. However, the "really good" early December 2017 weather, and memories of last year's wet spring, enticed Henrekin to apply more anhydrous than usual this past fall. The second corn nitrogen application–20 units–is made at planting with the pre-emergence herbicide application. Glyphosate-resistant waterhemp is Henrekin's top weed concern. He controlled it and other weeds in his 2017 soybeans using residual herbicides and dicamba, and plans on doing the same in 2018. "We planted 100% dicamba-tolerant soybeans, and it was a wonderful answer to waterhemp," says Henrekin. Also last year Henrekin sprayed a postemergence application of STATUS herbicide and glyphosate on all corn acres. That program delivered good control, and he plans on using the same program in 2018. Henrekin is focusing on two areas in 2018 to experiment with in order to boost yields. One area is micronutrients, as he tries to unlock more soil fertility on his variable soils. The other focus is on his corn and soybean fungicide programs. For micronutrients, plans are to run strip tests with calcium sulfate, and with boron, in 2018. "We have some gumbo and other heavy soils with high levels of magnesium," says Henrekin. "I'd like to see if adding calcium sulfate can help loosen these soils up and make them a little more mellow." The suggestion to run a test with calcium sulfate came from his area BASF Innovation Specialist Christopher Norberg. "We've got such high magnesium soils around here that we can often add some calcium and definitely see a yield gain," says Norberg. Norberg notes calcium sulfate also contains sulfur, and he sees that as a plus as well. "Most of our soils in central Illinois area are sulfur deficient," says Norberg. He sees sulfur as right behind N, P and K in his area's crop fertility needs. "Yields around here kind of plateaued, and then we started adding calcium sulfate and other sulfur sources, and we're seeing a yield benefit." Henrekin is already a believer in the value of sulfur. "We applied sulfur on every corn acre in 2017, and it really paid for itself," says Henrekin. "We plan to continue applying a combination of calcium sulfate and Thio-Sul to all corn acres in 2018." Norberg is also encouraging Henrekin to run a test on applying boron on corn. "I'm a big believer in boron," says Norberg. "It's needed during the reproduction phase, helping with pollination, silking and kernel development." Henrekin hasn't applied boron before, but is planning to test it in corn test strips in 2018. "He knows sandy soils are more prone to boron deficiency and will definitely run tests on them. But he also wants to run tests on multiple soil types "to see how it pays under different conditions." Henrekin will be testing several changes to his current fungicide plan in 2018. In 2017 he treated all corn acres with Headline AMP fungicide at tasseling, and treated all soybeans with one application of Priaxor fungicide at R3. "Priaxor worked phenomenally well on our soybeans, keeping plants green into the fall considerably longer," recalls Henrekin. In 2018 he'll test increasing the number of Priaxor applications on soybeans from one at R3 to two applications at R1 and R3. Those will be compared in side-by-side test strips with soybeans treated with one Priaxor application at R3. On corn, Henrekin will plant test strips of an application of Priaxor at V10, followed by an application of Headline AMP at tasseling, and compare those results with the one Headline AMP application.